The Toronto Maple Leafs defense has by no means been full of all-star caliber players and has struggled on numerous occasions since the post-lockout era. Needless to say, it's never really been one of their strong points. This season however, their defense may be one of the few bright spots on a season that many are predicting to be more than abysmal. The one thing the Leafs do have going for them this season is a ton of depth on the back end. They have upwards of nine players who all believe they deserve to be on the big club come the start of the season. Of those nine, only Tomas Kaberle, Pavel Kubina, Mike Van Ryn and Jeff Finger seem to have a spot locked up. That leaves two (three if Wilson decides to carry seven defensemen) spots open. There are five players vying for those final two spots: Carlo Colaiacovo, Jonas Frogren, Staffan Kronwall, Luke Schenn and Ian White. Cliff Fletcher has already said that Luke Schenn will have to "overwhelm" them to make the team, which is a good point. You don't want this kid being used as a fifth or sixth man and seeing limited minutes, it wouldn't help his development. You would rather see him get top minutes for his junior club in the WHL or even get top minutes in his first year for the Toronto Marlies. Thus, it's pretty safe to assume he is out of the picture. Next up is Jonas Frogren. Ah, Jonas, we barely know you. From everything I've heard though, he is a tough-hardnosed stay at home defenseman that likes to play against the other team's best players and doesn't shy away from the corners. It's about time they got a player of his ilk to keep the opposing team's best players on edge; I consider him to be the Dimitry Yushkevich of this era. The Leafs fought long and hard for him almost all summer so it's highly unlikely he will not be a Maple Leaf on opening night. That leaves one spot for three players. If I was a betting man I'd say that Carlo Colaiacovo would nab the final spot, just because management probably thinks he deserves a chance at a full season of health and because they are scared that if he was traded at this stage of his career he might blossom into a superstar elsewhere, I'd be scared too. Staffan Kronwall will probably be sent down to the Marlies because his trade value can't be too high at this stage of his career. I was really hoping he would get a shot this season, but someone gave him the Finger (wasn't that bad? Was it?). He has all the tools to be a full-time NHL player, he just has to learn to put the package together and become more consistent. The likely scenario for Ian White then is a trade out of town. 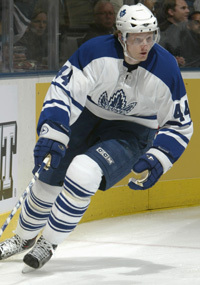 He has performed quite decently in his first couple of seasons as a Maple Leaf after being called up from the Marlies. He is a good guy on the second power play unit as he has a good low point shot, but that's not what this team needs at this stage in time. So folks, there's your six opening night defensemen according to yours truly. The one thing that is a constant in sports and is the most unpredictable constant is injuries, because once those occur, it's a whole new ball --err, hockey game. It says here that injuries are the only way those six won't be on the roster. With an offensive group that is going to be --well, let's just say not too offensive, the team will have to rely a great deal on its goaltending and its defense. The former coach, Paul Maurice, talked the talk, that's for sure, but he rarely walked the walk as the defense never seemed to get better with him at the helm. Now it is Ron Wilson's turn, who is talking the talk, but again whether he can walk the walk is still a question on many Leafs fans minds. i think the leafs have 3 things going for them:1) an elite coach2) defensive options as stated above3) a fresh team outlooki think the best thing for the organization, as much as it pains me to say this, is to get out of the sundin drama. Love(d) the guy, but in the new direction of the team, i just don't see how he helps. You know, I knew I forgot someone. Damn it. LOL. I think he has to make the team and they will rotate 7 dmen then. i would say stralman for him to progress better and not rush him would be to put him in the marlies until carlo gets injured:P. Then bring him up so he won;t be a seventh D or in the press box. He was the guy i would watch when i watched the leafs and to see him become a better player i would have him stay in the AHL then play for well sorry to say bottom of the barrel team. I would do the same with tlusty do not ruin him more by keeping him up. Trust i am pissed when teams rush players i know (G. Latendresse) should have been in the A for atleast a year. My bet is the top 5 include: Kaberle, Kubina, Finger, Stralman, Frogren and the 6th spot goes to either Van Ryn or Colaiacovo. Schenn is not going to play for the Leafs this year, no matter how impressive he is...even if he does blow them away giving him one more year to develop is only going to make him even better for next year, so why not wait? White doesn't fit into Wilson's style of play and we're going for a more gritty defensive style, so he's either a Marlie or traded for a mid to late round pick.I think Colaiacovo should get the spot because he's very solid when healthy...if he gets hurt then bring up Van Ryn. But to not play him because he might get hurt (especially replacing him with an injury prone guy like Van Ryn) is the worst approach possible. nreed21 you are dreaming if you think colaiacovo would fetch a 1st right now. Give him a season to prove his worth. also, Schenn can't even play for the Marlies this year, it's either Kelowna or with the big team. Why can't Schenn play for the Marlies?Also as far as sending players like Tlusty to the AHL... theres a lot that a player learns playing in the NHL that they can not get in the AHL. Tlusty needs to play against the best in the world if he can ever hope to compete at that level. Same goes for most of our young guys. Don't rush them... but dont let the get used to the AHL's style for too long or they might end up being career AHL'ers. There is some agreement that if a player is under 20 they can't play in the AHL. They can come up and play the first 9 games with the big team but then a decision has to be made to keep them up with the big team for the year or send them back down to the OHL or wherever they would play instead of the AHL. I really think that the Leafs will use the 6 d-men as stated above, but might use somebody like a Stralman or White as a forward. Ron Wilson teams will dress 7 defenseman on occasion. 09 No Goals for Leafs in 2008-09?